I just remembered that I love Tennis. Yesterday I was watching some of the French Open and it got me thinking about the last time I actually played Tennis. After a few minutes I realized that I couldn't remember and that it was time to do something about it. So, I called up a friend and I was like how about some Tennis. So I am in a Tennis state of mind and that has carried over to today's Flashback. 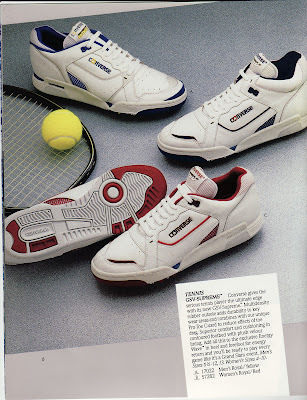 I don't know much about the GSV series, but I assume that Jimmy Connors wore them. I know in the Converse Fall Catalog it says, "Our Story Goes Everywhere. Everywhere Converse people go: to the gym, the courts, the water. So go- rediscover Basketball, Tennis, Boating...and enjoy the next Converse Century in shoes that tell a story." However, I didn't see any Tennis shoes besides a few re-issued shoes, nothing performance wise. Hopefully that taste of re-issue and the mention in the catalog will lead to some Performance Tennis shoes in the near future. Here is the information from the picture, it gives great detail on what the GSV's were all about. That's it for this week, thanks for stopping in and don't forget to vote on the way out.